Prominent & Leading Wholesale Trader from Ghaziabad, we offer star aqua shield - acrylic elastomeric tough and flexible waterproof paint. Star Aqua shield is a fluid applied, white, tough and flexible waterproof membrane, formulated with100% acrylic elastomeric resin which forms a thick rubber-like blanket of protection that expands and contracts with roofs. Star Aqua Shield is truly waterproof for flat roofs, pitched roofs, Parapet Walls, Metal Roof Decks, Terraces, etc., and provide a seamless roofing membrane that stays watertight longer than conventional seamed roofs. It will not crack, crumble, or peel despite exposure to severe weather or total joint movement. 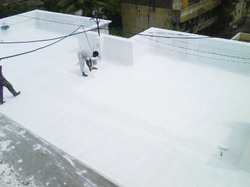 Uses For waterproofing and protecting a wide assortment of roofing substrates that are structurally sound such as Concrete roofs, corrugated metal roofs, asphalt shingles, PU foam, wood etc. Fire retardant and provide insulation to heat and sound.